Good cooks are always learning, always trying to find ways to make their recipes better. Fresher ingredients, adjust for nutrition and diet, try a different technique–all is fair in love and cooking! 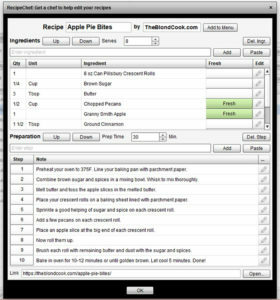 RecipeChef is a new kind of recipe software / kitchen calculator. Imagine having a world-class chef looking over your shoulder and giving you tips, discretely. You’re in charge of your kitchen, but the chef loves to help, and they have some great ideas for you. Here’s what RecipeChef can do for you! This is your recipe database. Keep all your recipes organized and ready to use again and again. 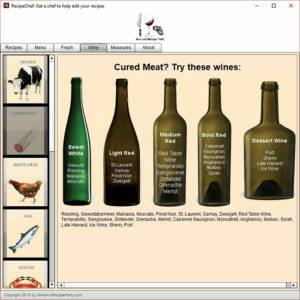 Easily import new recipes just by cutting and pasting. When are cataloupes in season? 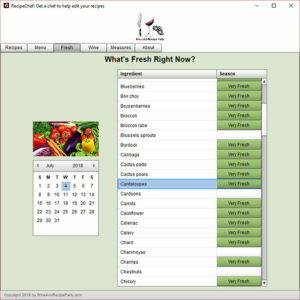 If you had RecipeChef, you’d know exactly when and what’s in season all the time. It even marks ingredients in your recipes so you know when farm fresh is available. Create, modify, and tune up your recipes. See which ingredients are fresh. Convert units. Leave it open and check off your prep steps as you make the recipe. 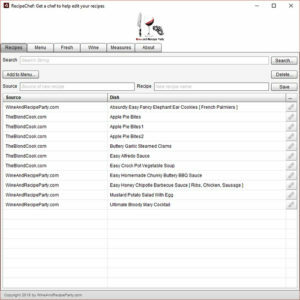 RecipeChef is your all-purpose Swiss Army Knife for working on your recipes. Red Wine with Meat and White with Fish? C’mon, you know you can do much better than that. Let our Wine Guide narrow things down to specific varietals, then you choose. Which Chardonnay do you like best? Or maybe you want ideas for something completely different. 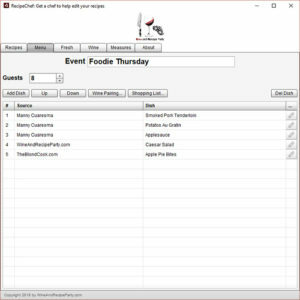 Plan a menu for next meal or party. You’ll want to gather all the recipes together, pair a wine with your dishes, create a shopping list for the meal, and make sure everything will be perfect for your guests. RecipeChef is still under development, but we’re moving quickly. If you’d like to be notified when it will be available, sign up for our mailing list. There’s a subscription box in the top left corner of our home page. We plan to offer a beta test where folks can try RecipeChef and give us your feedback on how to make it better. Once it’s finished, you can have it completely for free. Yup, that’s no typo. 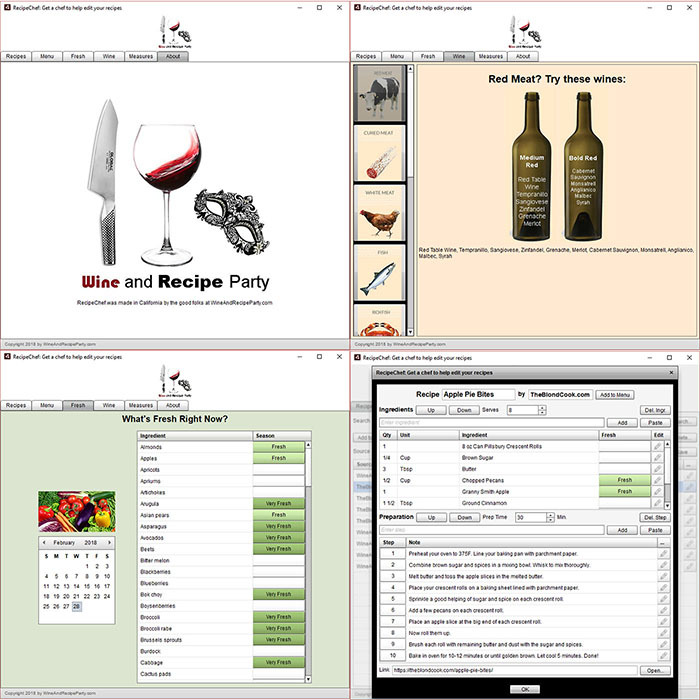 We want everyone to have RecipeChef. If you’re a Food Blogger, contact us. We’d be happy to make it easy to give your audience a copy of RecipeChef that’s even branded with your logo instead of ours.